Another vehicle isn't always the cause of damage to your own car. A pedestrian, young or old, could cause damage to your car through any number of ways, accidental or not. In this post, we’ll go over what type of insurance covers pedestrian inflicted damages to your vehicle. Vandalism can take place in a multitude of ways, whether you’re in your vehicle or away from it. An angry passerby could kick your door in, someone could key your car in retribution, a biker could squeeze by and damage your mirror or thieves could smash your window and hit every taillight with a baseball bat for good measure. Alternatively, your sparkling white work van could serve as the perfect canvas for some aspiring graffiti artist trying their hand at block lettering. In other instances, pedestrian damage could be accidental. Your car could be parked in the wrong lot as you go into the supermarket to buy some veggies. 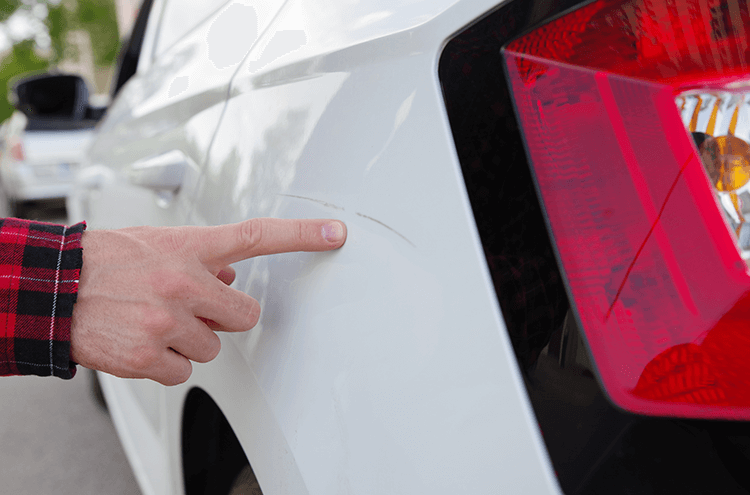 As you come back to your vehicle, you notice that a shopping cart has come to a rest at your passenger door, leaving a dent and paint damage. Once you’ve discovered the damage, you have to report it. If the damage is beyond superficial, you’re going to want to call the police so you can file a report – your insurers will request this. Please call the non-emergency number to avoid wasting important emergency resources. Next, take some pictures and call your insurance company. You’ll need to file your claim under comprehensive coverage, which is an optional insurance that covers you if your vehicle is damaged in an accident that doesn’t involve a collision or another car. Comprehensive coverage typically covers theft, vandalism and fire damage plus other types of impacts. Check your policy for the exact wording on what is covered, and if the damage cost is quoted above the deductible, you have the right to make a claim with your insurance provider. If you’re in a neighbourhood that sees enough windows smashed in during the night, you’ll want to take all the steps necessary to protect your vehicle. You can also ask your insurance company if there are a normal amount of claims in your area, or if they're higher than average. Park in well-lit areas with streetlamps and if you can, park somewhere with security cameras nearby. Avoid leaving your vehicle in an empty lot overnight and opt for garage parking if possible. Invest in a good car alarm or set up security cameras in your driveway. The more precautions you take to protect your vehicle, the more you could save on car insurance.